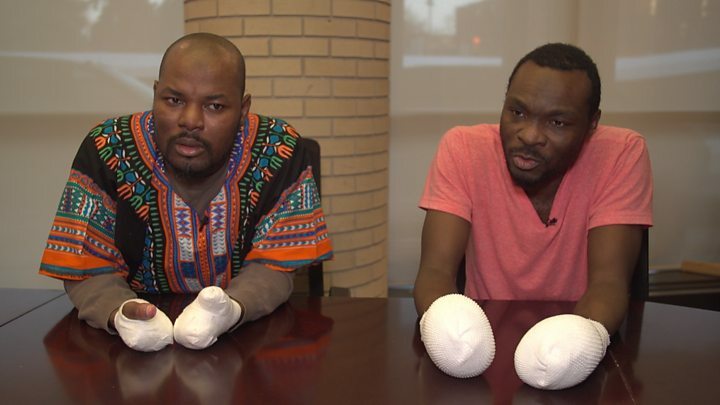 "Everybody knows what happened to us"
Seidu Mohammed and Razak Iyal nearly died in 2016 while sneaking across the Canada-US border during a frigid late December, hoping to gain asylum. Their experience made them the public faces of a wave of migrants to Canada who followed soon after. It's a warm, late summer evening under a wide prairie sky, and Seidu Mohammed is in his element. The 26-year-old is on a football pitch, a defender at ease on the field, playing on a high-level amateur team in the Manitoba Major Soccer League. A one-time professional player from Ghana, his career was derailed when he was outed as bisexual while training in Brazil in 2014. He never returned home, fearing persecution for his sexuality in his country, and instead starting on a fateful journey that brought him to a Minneapolis bus station on Christmas Eve, 2016. There he met Razak Iyal, 36, a fellow Ghanaian who had fled the west African nation when a family dispute over his father's estate turned violent.Both men were facing deportation back to Ghana after being denied refugee status in the US.Instead they risked crossing into Canada, finding themselves struggling through a waist-deep field of snow in the night-time bid to cross the boundary between southern Manitoba and northern Minnesota. They spent 10 hours outside, poorly dressed for the brutally cold winter landscape, wandering near a single-lane highway surrounded by farm fields, until a transport truck stopped to offer assistance. Both had their fingers amputated due to frostbite and spent the next three months in hospital in Winnipeg, Manitoba. The experience has brought the one-time strangers, born ten years apart in Accra, Ghana's capital, close. "It's coincidence we are from the same city, same area, same community, but we never met before [that night]," Mohammed says, sitting on a sofa in Iyal's modest apartment in central Winnipeg. "We are like brothers, not friends." Says Iyal: "We go beyond friendship now." Over 30,000 other asylum seekers have followed in Mohammed and Iyal's footsteps, illegally crossing the border before turning themselves over to authorities to make refugee claims.The vast majority crossed at Roxham Road, a dead-end rural road in upstate New York that ends in a ditch and thin brush and, through that, the province of Quebec. The number of migrants has dropped since last summer, though just over 1,600 people still crossed in July. There are over 200,000 pending asylum claims, and the wait for hearings by Canada's refugee board have edged up to an average of twenty months. Of the fraction of cases that have been processed, just less than half have been accepted by Canada as refugees. The Trudeau government has always openly welcomed refugees and immigrants into the country. But they began to temper their message, warning that seeking asylum is not a "free ticket" into Canada as more and more migrants began arriving at the border. Both Mohammed and Iyal were granted refugee status last year. They worry about the growing fractious debate about the migrants crossing into Canada, about related costs and the need to do more to secure the borders. "[Immigrants and refugees] are hardworking people," says Mohammed. "We are not criminals. We are here for a new life." The federal government is under pressure to suspend the Safe Third Country Agreement with the United States, under which refugee claimants are required to request protection in the first safe country they arrive in.Crossing between border points allows asylum seekers to circumvent that part of the agreement and to ask for refugee status in Canada. Both Mohammed and Iyal were in the US before travelling to Canada and, under the accord, couldn't request asylum at an official border crossing. But there is a loophole: a claim can be treated by Canada once the asylum seeker is on Canadian soil. Iyal says without the programme - which is meant to avoid so-called "asylum shopping" between countries but is also the reason asylum seekers are avoiding formal border points - it would be safer for refugees crossing into Canada. "We could have gone straight to the border, without struggling, without [almost] freezing to death," he says. The pair are adapting to life with the limitations of having lost fingers to the cold. Eating, dressing, paying for the bus, signing documents - these are all small daily challenges. Mohammed has switched to snap-button over button-up shirts He practiced putting on socks over and over until he could do it on his own. He is considering an additional surgery offered by his doctors to open up part of his hand to allow him some grip. Both still need help lacing their shoes, Iyal at the mosque, or Mohammed on the pitch. Iyal is thankful he still has one thumb, which gives him some dexterity. "Don't think about what happened to you," he says. "Think about your future. We always think about our future, what we can do to contribute to this country." Mohammed still finds himself in shock at the loss of his fingers. "That time when we were in the hospital, we were crying, we were feeling sad, like 'how are you going to survive like this"But God has done a lot for us in our life for the past-year-and-a-half." Much has happened in the months between since their release from hospital. Both were recently fitted with prosthetics, which they are learning to use. Mohammed attended his first Pride parade, where he said seeing the LGBT community gathered together made him feel like "this is a safe place". He has spent some time coaching youth football. Iyal is taking business classes, hoping to launch an electronics business, like the one he had back in Ghana, and hire refugees, and he hopes to one day reunite with the wife he left behind. They have found a close community of friends in Winnipeg, many of whom are also immigrants or refugees. A play, "Boundary Avenue", was produced based on their journey. A poster signed by the cast hangs on Iyal's wall.One Trunk Theatre artistic director Andraea Sartison told the BBC that the issue of asylum seekers has been "at the forefront of a lot of people's minds and the media here". After being introduced to the pair, the team behind the play felt compelled to tell their story. They spent hours interviewing them, and Iyal and Mohammed eventually collaborated on the final script and production of the piece. Iyal is a frequent volunteer at the Canadian Muslim Women's Institute, which has a donation centre that many asylum seekers visit for basic necessities, from clothing to furniture. Yasmin Ali, president of the organisation, says a number men, including Iyal, began to use their site as a meeting place and eventually decided to put themselves to work as volunteers. "It's amazing to see what [Iyal] can do - lift things, move things. He's adjusted, adapted," she said. She said the two have become leaders in the community of newcomers, shepherding others through the process of settling into Canada. Still, both are frustrated at their challenges finding permanent work. "I lost my fingers, I didn't lose my mind," says Iyal. "I want to contribute to this country, I want to pay my taxes." He says he, Mohammed, and the fellow migrant friends they've made frequently think about the lives they left behind. "We're always happy we are here, especially that we are alive," he says. "We all miss our parents, we all miss our old friends, we all miss our siblings, we miss our wives, but I'm still happy that I'm here, alive."